- Heat treated and tempered for long life. - Set consists of 28 Punches sizes 3/32 to 1/2 by 64ths plus handy 17/32 size. Length 4-7/8. - 1/2" to 1" lenght 5-1/4"
- Diameter .0025 under size to facilitate use. TP-8280: 28 PCs Transfer Punch Set. 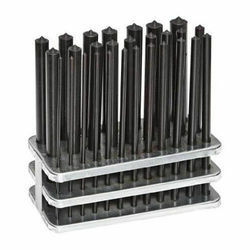 3/32" to 1/2"
TP-8281: 28 PCs Transfer Punch Set. 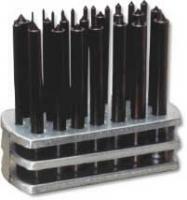 1/2" to 1"
TP0000: Set of 28 punches in metal stand(3/32" to 1/2" by 64")plus 17/32"
We have founded ourselves as a recognized manufacturer of transfer punches. We have been able to offer our clients a qualitative range of transfer punches. Enriched by our vast industrial experience in this business, we are involved in offering an enormous quality range of Transfer Punch. We are a emerging Supplier of transfer punches.